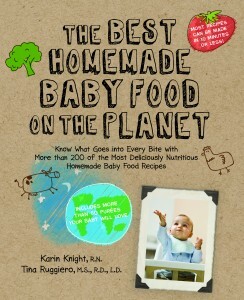 When I came across this book, The Best Homemade Baby Food on the Planet By: Tina Ruggiero, I thought it was going to just be another book on how to make your own baby food. However, I was way off base, I absolutely LOVE this book for many reasons. After reading just a few of the first pages and thumbing through the book I quickly realized how many actual recipes for baby food were possible to make. The author, Tina Ruggiero, does a phenomenal job in laying out the basics of homemade baby food, the different stages and what to feed your baby, toddler feeding, nutritional information about elements of food, special considerations for children, and in the very back is a feedback chart so you can document what your child liked and disliked. 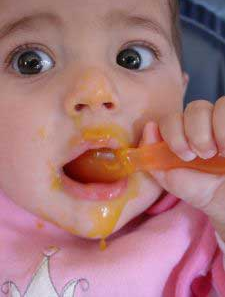 In the first section, Tina equips you with all the knowledge you will need to successfully make homemade baby food. She lays out a nice list of all the tools you will need to prepare all your foods. She has also put together a nice list of different foods to keep in your pantry for your children, and and extensive list on food safety tips. The bulk of the book is broken up into different sections for the different stages you will go through with your child. There are recipes for six months, eight months, nine months, ten months, and eleven months, and she rounds out this section with twelve to twenty three months. The recipes are compounded of different foods to incorporate into your child’s diet. It is not just a book on how to boil vegetables, blend them and freeze them. Tina has constructed her recipes in such a way that your baby will enjoy each food, and as the parent you will have the satisfaction of knowing that your baby actually likes their vegetables. She has recipes such as Pear Potato Puree, Apple a Day Oatmeal and Blueberry and Banana Breakfast. The great thing about this book is that it covers a wide age range. I can use this book for my six month old, my two year old, and even my five year old loves the recipes. Such a versatile book, it is awesome. This is a fantastic section to become familiar with. It takes you through the different components of things such as Fiber, Fat, Carbohydrates, and Proteins. It describes what it does, the different types of each nutrient, and the sources of where you can find it. What a great section to give parents knowledge of why each component of food is important in your growing baby’s health. Now a days kids can be extremely sensitive to many different things when it comes to food. In this section you will learn information and get a better understanding for lactose intolerant children, high risk children, fish and shellfish, teething and even choking. I can’t recommend this book enough. I highly suggest if you are new to the world of making homemade baby food, then pick up this book and get to preparing these recipes. They are awesome and your baby will only thank you in the long run. Great Job Tina, for putting together such a great resources for families to feed their children in a healthy way. To get your copy of this fabulous book CLICK HERE. 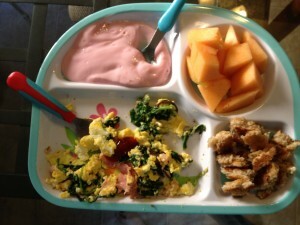 For other great articles on meal time for toddlers check out this article by The Mom Crowd’s Contributor, Tara. In the last 24 hours I have been invited to 2 different cookie parties happening this month. I don’t think that they will be my last two either. This is the first Christmas that my first child will understand a few Christmas traditions and I am so excited! I am sure she will be elated to know that Christmas cookies are a yearly tradition. Here are 5 ideas for Christmas Cookie Parties if you are thinking of throwing a party. A cookie exchange party can happen in the evening for a girl’s night out or during the days with kids and chaos. My friend Tashi is hosting a Christmas cookie exchange this year and here are her rules that you could follow as well. 1. Bring 7 dozen of your best and yummiest cookies. 2. Bring 12 copies of your recipe. 3. Bring 1 dozen of your cookies arranged nicely in a basket or platter. 4. Bring a container to take home your new cookies. 5. If you don’t have time to bake or have ruined your recipe but still want to attend, just go to your local bakery and pick up 7 dozen yummy cookies. A cookie decorating party is completely fun for the kids and adults during the day time. Everyone can have fun while making a mess and eating delicious cookies. 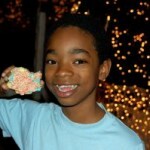 My friend Jennifer C. is hosting a cookie decorating party and she will be providing the cookies and frosting. If the weather cooperates the party will be happening in the back yard. The guests only need to bring 3 things: (1) their kiddos (who aren’t in school), (2) some sprinkles to share, and (3) a take home container. I am sure you can ask other moms chip in to bring cookies and ask someone else to bring frosting if you don’t want to provide all of the elements. My family has had a cookie bake day almost every year. All the women get together and bake cookies in the same kitchen together. There is always a line for the oven, we are on top of each other, and making a mess on every counter space available, but it is so much fun! At the end of the day we have massive amounts of cookies and we trade what we made. It’s really fun being together and being silly. Perhaps you aren’t looking to gain a few extra pounds this December and would prefer a non-edible party – you can always hang your cookies on the tree instead! I have never made these myself, but I really want to this year. It seems like it would be fun do with my kids and other kids as well. Here is a link to make Christmas Dough Ornament Crafts. Cheer up homeless shelters and hospitals with your cookies! After you have a cookie party you can package them up to give to a local hospital or shelter. You can get the kids involved and tell them who the cookies are for. They could even write a note or draw a picture to go with the cookies. You can even take it a step further and collect children’s books to give away along with the cookies. There are homeless shelters with children too. I am sure they would love cookies! A step further would be to gather your friends, family, or church, and provide a cookie decorating party for the children at the shelter. Here in San Antonio, The Strong Foundation, helps homeless families get back on their feet. Check with your local shelter’s volunteer coordinator to see if you can help. 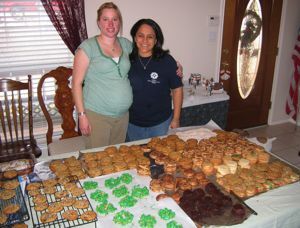 Have you ever hosted a cookie party or participated in one? 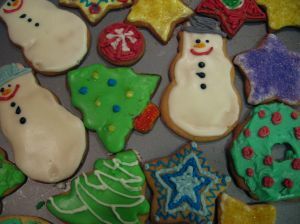 What is your favorite Christmas cookie? Thankful for Thanksgiving Food: Link up your recipes! We don’t usually talk about recipes here on The Mom Crowd, but how can you NOT when its Thanksgiving? I LOVE Thanksgiving food. I always look forward to eating several Thanksgiving meals during this season. I can’t wait for the leftover stuffing, turkey and gravy that is going to fill my fridge at the end of this week. My family is spending the night at my in-laws house the night before Thanksgiving this year. We will be cooking the night before and getting up early to cook some more. Each family member is responsible for different parts of the meal. I am always in charge of green beans. Last year I added creamed corn and this year I will also be baking a ham. My mother-in-law and brother-in-law usually handle the turkey. Here are the recipes that I will be using this week. Please link up your favorite thanksgiving food recipes at the bottom in Mr. Linky. I made up this recipe based on how I remember my my mom making them. 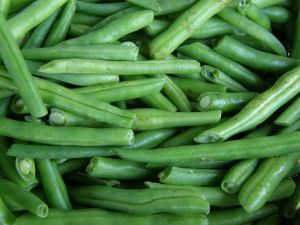 Fresh green beans are so easy to make and so good! You can even make these the day before. If you make the day before, store them in their boiling juice to preserve the bacon flavor. 1. Snap the green beans by snapping off the ends, then breaking the rest of the bean into bite size pieces. 3. Cut the bacon into 1.5 inch pieces. 4. Put the beans, bacon, salt, and pepper in a pot and fill with water. 5. Boil the beans for about 30 minutes. Pull one bean out to taste to see if it is cooked through enough for you. Be careful not to boil too long or they might get mushy. Cream Corn - I LOVE this Cream Corn recipe on Allrecipes.com. I have made this one several times and it is so good and easy to prepare. Honey Glazed Ham – I don’t usually eat ham, but for some reason I was craving one this year. I didn’t want to spend the money on a Honey Baked Ham and the pre-done ones at the grocery store were too expensive. I found a regular ham at the grocery store on sale for $.99 a pound! So I bought a big one for $7 to practice with. I made this Honey Glazed recipe and it was delicious! The recipe says to use the broiler at the end for a few minutes. My ham burned on the very top when I used the broiler, but I cut off those burnt bits. I then used the ham bone and made this Crock Pot Ham Bone and Beans recipe. We licked our bowls clean after this dinner! I really enjoy discovering new recipes that have already been test driven. Please use Mr. Linky below to post any recipes that you love to make for Thanksgiving!